Whenever I talk about all natural or home made cleaning products the response is always, “does it work?”. The short answer is ABSOLUTELY. Somewhere along the way we have been brainwashed to believe we must KILL KILL KILL bacteria and viruses by using toxic substances like chlorine bleach, triclosan and fancy “antibacterial” products. Thanks to mass marketing ploys such as Clorox’s “Essential to a Healthy Home” advertisement. The truth is simple. Yes we need to keep things clean, no we don’t need super antibacterial products to do that. In reality, over use of bacteria killing products can be counter productive. Clean well, clean naturally, clean often. A wonderful cleaning solution is the Vinegar of Four Thieves recipe. We’ve been using this for years. It does have a vinegar smell (add more herbs to help counteract), but it works beautifully. Place desired amount (about a small handful or 1/4 cup) each of dried lavender, rosemary, sage, rue and mint into a quart size glass jar. Fill the jar completely with organic apple cider vinegar. Cover tightly and allow to sit in a dark, cool place (back of cupboard) for about 45 days. Strain fluid into spray bottle and discard herbs in your compost pile. Because this has to set for 6 weeks, we make several jars at once. 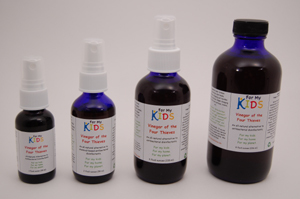 For those who don’t have the time or desire to make their own recipe, For My Kids carries a similar cleaner in small bottles which are perfect for travel, spraying down shopping carts and public restroom handles as well as larger bottles for home. Do you know the story behind the thieves blend? My friend who works at Eden Bot. says it was used by thieves during the plague, and the never got the plague when robbing dead bodies and their homes. We clean our school with a thieves blend that contains cinnamon oil and smells wonderful. I love this cleaning recipe idea. I am a big advocate of natural cleaning and reducing chemical use whenever possible. I also use and teach others about Norwex Enviro Products – they have a full line of microfiber cleaning cloths, mitts and mops where you use JUST water to clean – no chemical dips used to kill bacteria. The microfiber cleans up 99.9% of the bacteria and then the silver compound inside goes to work on the bacteria as the cloth dries. Cool stuff! I will try your concoction with my microfiber. Thanks! Maybe will link back to this on my website too! Thanks for this post and the great resources! It is amazing how many toxins there are in many commericial cleaners (and how much we pay for them!). I think the story is AWESOME (in a freaky funny sort of way)… grave robbers who kept themselves healthy with the vinegar blend. The best part is using whatever spices you want to keep things smelling pretty… cinnamon oil is a great idea! @ Marlo… I use microfiber cloths for most of my cleaning. We are a paper towel free house and microfiber doesn’t leave lint behind. Thanks for sharing! Thanks for the quick, easy and inexpensive recipe. Jennifer- good idea with the cinnamon. I get tired of smells very easily, so it’s nice to know that I can switch it up a bit! Thanks for this! I have heard that using thieves will get rid of mold. You can soak it on a cotton ball and leave it under the sink. @ Debra, it sure worked when sprayed directly on the mold growing in my laundry room! I sprayed, sprayed, sprayed that ugly black stuff… let it sit, rubbed it off and repeated. It took less applications than chlorine bleach has in the past and isn’t toxic. I will have to put some soaked (organic) cotton balls in those mold prone spots! I appreciate from this posting. Yes you are right many toxics are used for cleaning houses and office cleaning. Many germs and becterias are gathered on the floor and roof. So that we can use these toxics for kill them. I also provide cleaning services at Hampshire. But we used only factory made toxics. So now i think we can try some self made toxics. let’s try. Thank’s for the tips. Your home made cleaner recipe seems eco-friendly as well as easy. This can also help us to keep away the harmful toxins containing cleaners. Thanks for sharing.